ASUS VivoPC-VM40B-02 is a compact, solid, great looking, functional, versatile and very easily upgradeable desktop PC with a slide-out cover. It is more than adequate for most things you’d do on a computer on a daily basis with its entry level ultra low voltage 3rd generation Celeron processor but not for super demanding complex software or the most advanced games. ASUS VivoPC comes with the 64-bit dual core Ivy Bridge Intel Celeron 1007U processor (2MB L3 Cache) at 1.5 GHz, 4GB DDR3 RAM to multitask smoothly and that can be upgraded to a maximum of 16GB, 500 GB hard drive at 5400 rpm rotating speed + Cloud based Asus WebStorage- 100GB free for 12 months to allow you to have access to your data anywhere and the Windows 8 operating system. You can easily upgrade the hard drive (preferably replace it with a Solid State Drive) and memory with the slide-out cover that is designed to be quite user-friendly. Sound quality is quite OK with the MaxxAudio tuning and the built-in Asus SonicMaster speakers of 2 x 2W, for movies, songs and games and you will get even better sound if you connect to your HDTV or home theatre system via an HDMI port. It provides up to 8 channel audio support via the optical SPDIF port and 3 x audio jacks (Speaker Out/Mic In/Line In). Graphics card is the Intel HD Graphics so don’t expect to play those latest games or run very demanding graphics software on it but you will get Full HD resolution- 1920 x 1080 pixel performance depending on what type of external monitors or TVs you’re using. You have both the HDMI and VGA ports to connect to your large screen HDTV or any HD display. The USB keyboard and mouse are included in the package but not the monitor. 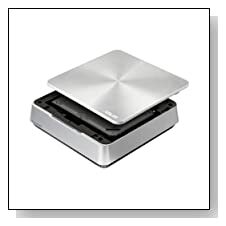 Elegant spun metal finish ASUS VivoPC weighs 2.65 pounds with measurements of 7.48 x 2.21 x 7.48 inches so it is rather compact and portable for a desktop PC- only a fraction of a regular desktop tower and would look great in any room of your house and can easily be placed anywhere in yr office or home. WiFi Go technology allows you to use your mobile device as a remote control for full PC navigation. It offers a variety of connectivity options, including the advanced 5G 802.11ac Wi-Fi adapter that is much faster at up to 1.3 Gbps speeds, 10/100/1000Mbps Gigabit Ethernet, Bluetooth 4.0, 4 x USB 2.0 ports, 2 x USB 3.0 ports that enable up to 10 times faster data transfers and 50% faster device charging, 2-in-1 Memory Card Reader that supports SD/ MMC, 1 x VGA port and 1 x HDMI port. 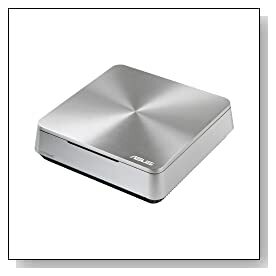 Conclusion: Nice looking, stylish, durable and compact ASUS VivoPC-VM40B-02 desktop is very easy to upgrade with the slide-out cover, has a few modern-day connectivity options like the latest technology 802.11ac wireless, Bluetooth, USB 3.0 ports, free 100GB Cloud storage for a year. It is power efficient with a TDP of 17 watts, boots up pretty fast, works quietly, stereo speakers perform well, and as negatives it is not mountable on a monitor like some other units, CPU is a little underpowered for more advanced stuff but just cool for what it is designed to do, and some of the connectivity ports at the rear can be a little hard to access. It comes with the user manual, a quick start guide, power cord, the warranty card- a 12 month North American warranty and 24/7 great technical support by Asus. Although it is not a gaming machine and doesn’t have the price tag for one, it seems to perform smoothly in most daily tasks- net surfing, word processing, streaming videos, playing songs and less demanding games. Definitely a decent value for money computer!